The vision of Vitalvibe was born already in 2008. Dreams started to come true in 2011. Lucie, then already experienced raw food chef, led seminars on healthy lifestyle, implemented yoga workshops and lectures on vitarianism. The seminars could not do without superfoods, raw foods and bio products, which needed to be imported. The participants of the seminars were interested in these foods, but there was no shop in Czech that would offer ORGANIC & RAW products. For this reason people were buying them from Lucie. From here there was just a small step to founding our own shop. Jan, then a web solutions architect and internet marketing specialist thanks to Lucie fell for living foods. He made use of his technical skills to start creating his own e-shop. From the beginning he was realizing all the shop, graphics and promotion by himself. It took several long months (often supplemented with consumption of superfoods), but eventually everything turned out well. In 2011 the first version of Vitalvibe e-shop came into being. As the company kept growing, it was moving into larger premises and expanding its activities. Nevertheless, the original vision of healthier life, naturally sourced quality foods and sharing experience remained the same. The dream started to come true. It has been fulfilling incessantly with every new day, new product, new Vitalvibe team member and every new customer. Together we are creating a new form of being. We were unpacking, storing and wraping up first goods for the customers directly in our living room. We were queuing in the long lines at the post counters to send our first parcels. At the beginning were self-employed. Over the course of time the awareness of raw food grew and the number of people interested in healthy eating increased. Thanks to this the number of our customers, sent parcels and store supplies were growing too. At the end of the year we served our first customer. In Autumn 2011 our Facebook profile was created. 25/01/2012 Vitalvibe was officially established. In the same year we also opened our first shop enlarged with a little store of 20 m2 area altogether. We launched a new version of our website. We visited several exhibitions and fares all over the country. We also organized our first lecture featuring a foreign specialist. It was the natural healer, founder of Clohesy River Health Farm and Academy of Natural Living in Australia Dr. John Fielder. We welcomed Alice to our team. In 2013 we gave birth to more than thirty ORGANIC/RAW superfoods under the brand Vitalvibe Essential. We keep growing and need more space, so we move to a new place of operation. We have a new shop with enough room for organizing various educative events, seminars, lectures and degustation. We call it the Vitalvibe centre. In the same year we manage to participate in more than 14 events across Czech and Slovakia. In one year we processed more than 5.500 orders. Currently we ship goods to more than 13 countries. In June the amazing Alice leaves for maternal duties to be replaced by Míša. In the second half of the year we welcomed new reinforcements – Lukáš and Sabča. We have a beautiful shop and enough room for organizing our own events, but the store becomes insufficient for us. So we move again, this time to an ORGANIC certified central storehouse in Prague. We were moving on the Friday 13th, but everything ended up without any troubles. With the amount of customers also our team is growing. In 2014 Katka joined it. Vitalvibe centre newly resides on Veveří street in Brno. On around 200 m2 we have at our disposal a lecture room, kitchen for workshops, shop, consultation room, several offices, and what’s more, an outside sitting area. We opend the newly reconstructed premises by a several hours lasting ceremony designed not only for the Vitalvibe team, but also our partners and customers. We created the premises with regard to the Feng-Shui principles, cardinal points and business sectors. 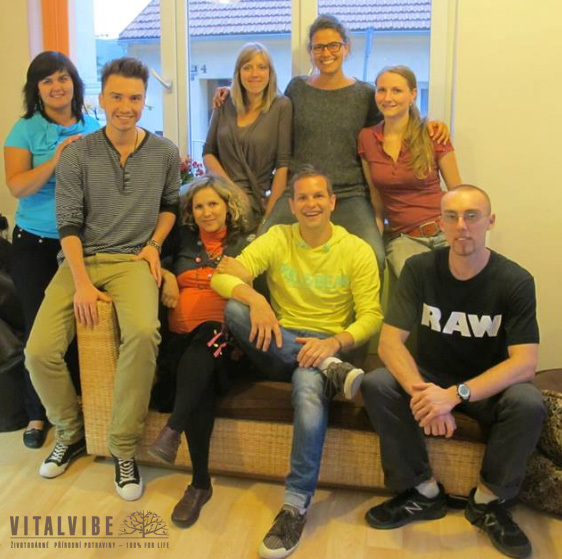 Our Vitalvibe team grew by new members – Simona, Lenka, Lukáš and Jirka. On 21/05/2015 we gave birth to the new website and e-shop (More here). Throughout the whole company history we have met and worked with a wide range of interesting people. We are happy that we can share our common goal with them – to introduce high-quality vital foods, present healthy life style and distribute vital energy. Tens of hours of meditation, thinking, dreaming and brainstorming led to many ideas and suggestions for the name of the company. The name was supposed to be original, short, memorable…and most of all it was meant to reflect the content of our business, characterize the core of our activities and be a carrier of our philosophy. For this reason we put together words like vitality, energy, vital and also positive vibrations, frequency or vibe. Vitalvibe can be understood as “life energy“, “life full of vitality”, or also “everything around us and including us are life frequencies and vibes”.